Flaminia Saccucci won first prize. 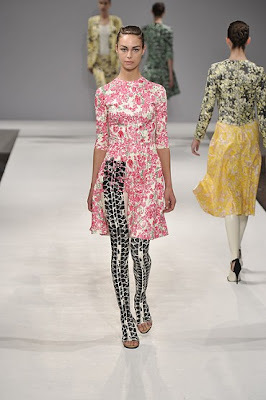 The print graduate, powered into first-place with a collection of rubber dresses and trousers hand-painted with flowers and tyre-tread marks. Saccucci won the L'Oréal Professionel Young Talent Award for the best student collection of the year. 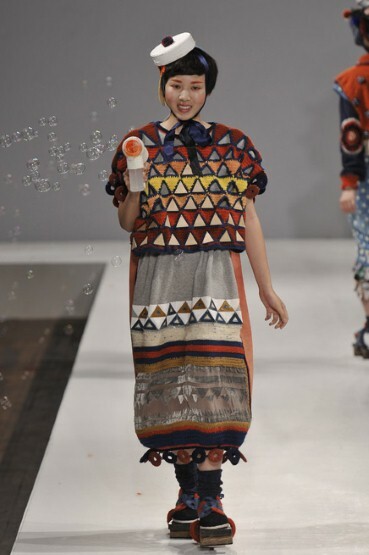 Momo Wang, another print designer, shared the second runner-up award. 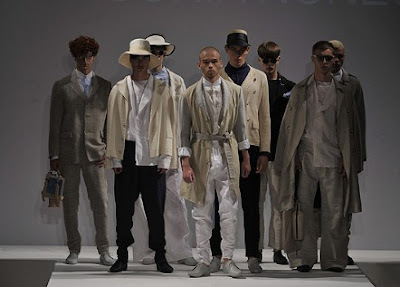 Menswear designer Ivan Curia Nunes, shared the second runner-up award. 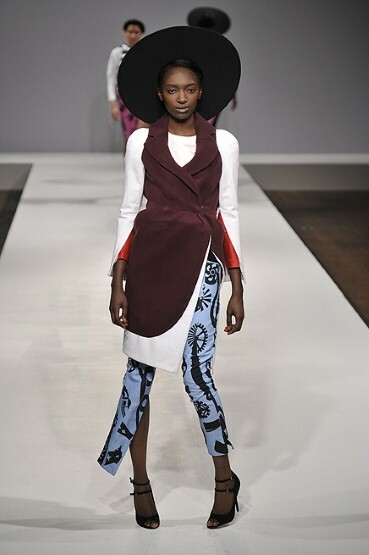 The first runner-up prize was given to Nicholas Aburn, for his cutaway-tailored women's wear, with exaggerated shoulders, lapels and belts. 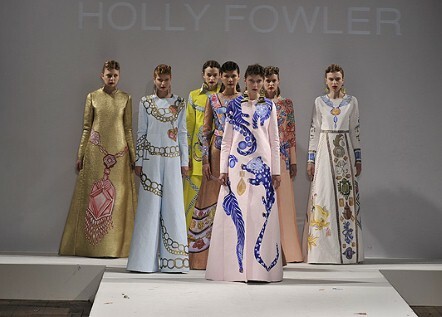 Holly Fowler designed printed dresses. 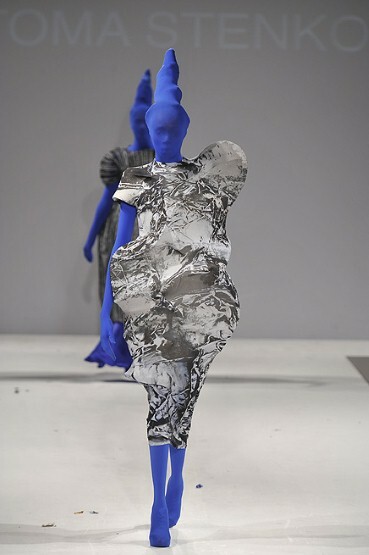 Toma Stenko designed black-and-white, charcoal-drawing printed cocoon-tunics over blue 'Tuareg' bodysuits with 'Walnut Whip' head-dresses. Shengwai Wang designed loose, textured, patchwork-ish knits in parchment, silver, black and sequins, and Prince-of-Wales check effects. Jo Qiao Ding designed drawstring tent-like sportswear. 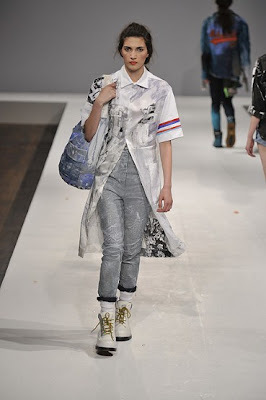 Daisy Lowe appeared in Josh Bullen's show. 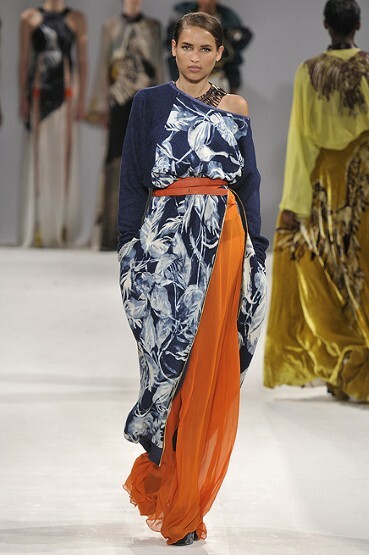 Annabel Luton's glorious soaring eagle, feather and mountain prints on velvet, chiffon and silk can be seen on the models in the background. Ryohei Kawanishi's eco-statement combined every handcraft technique under-the-sun, or beneath the waves, with mountainous heaps of fabric. 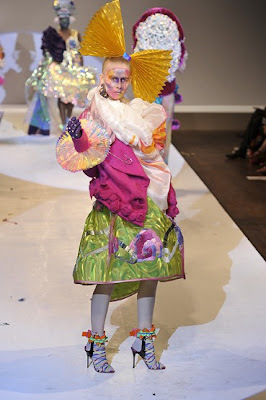 Crimson Rose O'Shea used lots of colour in her collection. 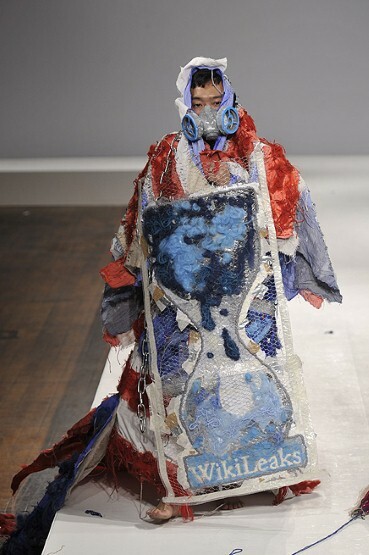 Creativity abounds in this collective of student designs. While I can appreciate the talent of winner, Flaminia Saccucci, my eyes were instantly drawn to the creations of Holly Fowler (#5) and Annabel Luton (#11). I can imagine that there is much more to come from this group of graduates.